Fundamental Lies of The UN's IPCC: "Food Production Harmed By CO2 & Warmer Temperatures"
The empirical evidence and peer reviewed research is indisputable - essential food production has dramatically improved while CO2 levels and global temperatures increased. Those are the stubborn facts that the adjacent chart reveals as unequivocal. Yet, because of the political-driven agenda the IPCC pursues, their latest report states that the world's food production would be more "secure" if CO2 emissions were reduced. Hmm...the exact opposite of known scientific fact. "There, it can be seen that enriching the air with CO2 almost always leads to significant increases in the photosynthetic rates and biomass production of all of the world's major food crops. And as for the highly-unlikely increase in global temperature that the world's climate alarmists predict to result from projected increases in the air's CO2 content, there are also many studies that reveal the positive consequences of warming for agriculture in Earth's cooler high-latitude regions, such as the recent study of Meng et al. (2014) dealing with maize production in the northern reaches of China. And there is also the significant body of work that reveals that as the atmosphere's CO2 concentration rises, the various temperatures at which different plants photosynthesize most proficiently rise right along with it..."
"Yet the primary efforts of both of these entities [Ed. the UN's IPCC and the UNFCCC] have been, and continue to be, directed against that which is most needed to produce the required amount food, as they both argue for reductions in anthropogenic CO2 emissions, which comprise much of the aerial "food" that sustains all of our food crops." Truth be told, the headline of this post is not an IPCC quote but obviously it represents what the IPCC is attempting to convince the public of, and unfortunately, the real-world, objective science does not support it in the least. Summary: The IPCC's fundamental lies continue to establish the blatant anti-science which permeates the entire UN's climate "research" reporting - it's propaganda spin all the way down. Additional 'C3' charts that challenge the IPCC's anti-science. Note: NOAA CO2 levels on above chart have been super-imposed on the original found here. A Reminder From NOAA: It's Now 17+ Years And Global Warming Trend Still AWOL In U.S.
NOAA's empirical evidence does not lie, nor deny. Over the last 205 months (Feb. 1, 1997 thru Feb. 28, 2014), the continental U.S. has cooled at a per century rate of -0.96°C. This has taken place despite the assurance of almost every taxpayer-funded climate scientist that the exact opposite would happen. They told us that their powerful and sophisticated computer climate models could accurately predict what future climate conditions we would experience. Except they were spectacularly wrong from day one; and yet, they kept spending multi-billions of taxpayer funds by throwing it down this failed climate research rabbit hole. Why were the "experts" and the computer simulations so, so wrong? "Realities about climate models are much more prosaic. They don’t and can’t work because data, knowledge of atmospheric, oceanographic, and extraterrestrial mechanisms, and computer capacity are all totally inadequate. Computer climate models are a waste of time and money...Inadequacies are confirmed by the complete failure of all forecasts, predictions, projections, prognostications, or whatever they call them." Addtional regional temperature charts and climate model charts. Download dataset used in Excel to create chart. Don't know how to chart in Excel? It's easy. Go here to learn how. Previously, we analyzed the claim by Democrats that global warming was being caused by American light bulbs. As shown here, that claim is found to be without any empirical merit - essentially, pure anti-science rhetoric on the part of Democrats. Next we take a look at the Democrats' claim that plastic bags are a major cause of global warming. For many Democrats, the banning of plastic bags in their local communities has become a personal cause célèbre that represents a badge of honor in the fight against global warming. But does the plastic bag "cause" have any scientific merit or is just more anti-science from quacks? To the math. In the U.S. some 100 billion plastic bags are used each year. Yikes! On average, it's been estimated that a plastic bag weighs 32.5 grams (for the record, a typical grocery store plastic bag weighs only 5 grams). And its been estimated that a plastic bag at the average weight represents about 200 grams of CO2 (when accounting for the plastic bag's production and eventual incineration). As a result, via simple multiplication, those 100 billion plastic bags equal 20 trillion grams of CO2, which converts to 20 million metric tonnes of CO2. Sooo.....what's the plastic bag impact on global warming from 20 million tonnes/year of CO2 over the next 20 years? Well, it's squat, too. 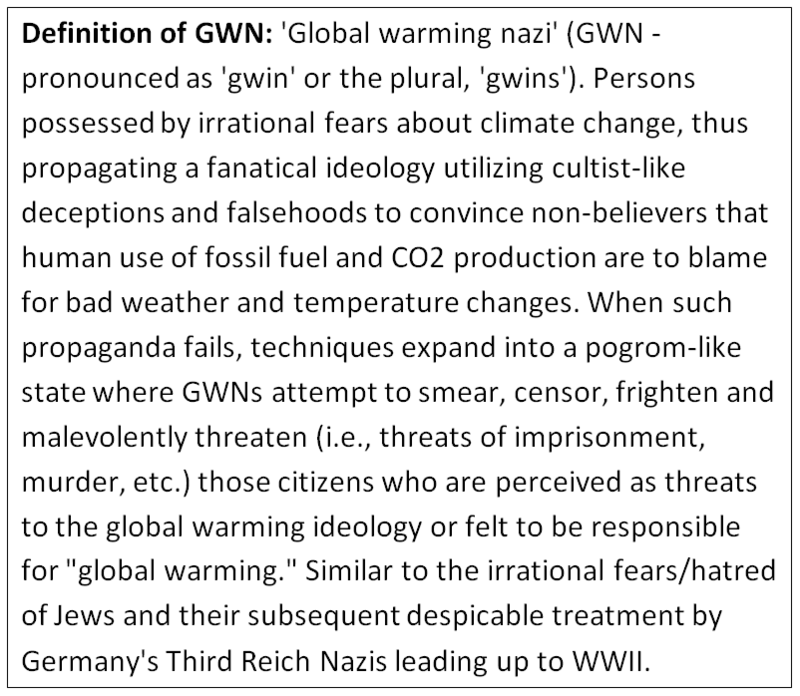 There is no warming impact, which makes the Democrats' claim more anti-science propaganda of the quackery sort. Banning plastic bags due to their climate change impact is sheer nonsense, but banning them for other environmental reasons is a whole 'nuther issue. For comparison purposes, the 'C3' estimator replica above also reveals what would happen to "global warming" if the entire U.S. economy shuts down for one year, eliminating some 5.8 billion tonnes of CO2 emissions from fossil fuel combustion - again, it's a global warming nothing-burger. Read about the 'C3' simple estimators. Per NOAA's published annual mean temperatures, the modern warming trend for the U.S., since the beginning of 1950, amounts to an increase of 1.35°C by century end. But this modern trend is just +0.36° higher than the trend that existed from 1895 to 1949. For the records, that existing pre-consumer/industrial CO2 trend was already at a significant +0.99°C, by year 2100. Yet, the prior period to the modern era experienced a climate change trend that was equivalent to a 1-degree change. Essentially, a built-in, long-term trend some 3-times larger than the additional modern trend increase. And this larger, pre-modern, in-the-pipeline warming trend took place when human CO2 emissions were a fraction of the modern era's - literally, one-tenth the amount of emissions (see chart). Then there is the whole embarrassing issue of the great climate science mystery, which includes the U.S. climate records. During the last 17 years that span from February 1997 through February 2014, the continental U.S. actually cooled at a per century rate of -1.0°C (per NOAA's monthly anomalies). Now what does all this empirical evidence mean? Well, obviously, the pre-1950 climate change was significantly greater than that of the modern era. Again, obviously, the modern U.S. climate change has been way over-hyped by politicians and government scientists when put into a historical perspective, as above. Then there is the indisputable NOAA fact that the last 17 years have witnessed a general cooling for the U.S., which, obviously, is at substantial odds with the "consensus" climate scientists predictions and the IPCC's "expert" computer models. When combining all this very obvious evidence, one can fairly surmise that either global warming is not very "global" or that human CO2 emissions are not a very powerful influence on the Earth's climate or institutional, orthodoxy climate science has failed, badly - or maybe it's a lot of all three. Additional regional and modern temperature charts. Note: NOAA U.S. dataset (converted to Celsius) used for temperature calculations from this site. CO2 emission datasets covering 1895 thru 2012 here and here. Used estimate for 2013 CO2 emissions.